Percy Reginald Stephensen was one of Australia’s pre-eminent “men of letters” whose work includes biographies and short stories. He also served as a ghost writer and a mentor. Stephensen sought to develop an Australian national culture and became a political activist and publisher in order to foster such a culture and sense of “Australianity.” Like many others such as Pound and Hamsun whose politics veered to the “Right,” Stephensen is often unacknowledged despite his pivotal role in developing an Australian literature and defining an Australian culture. Born in Queensland in 1901 of Scandinavian descent, Stephensen was from an early age of a polemical disposition and was inclined towards the Left as a university student. In 1921 he was a founding member of the Australian Communist Party. After graduating in the arts he took a teaching position in 1922 and formed a communist association. He was also one of the first to write an in depth review of D. H. Lawrence’s novel Kangaroo, when serving as a writer for a Labour Party newspaper in Brisbane. In 1924 he was elected Queensland’s Rhodes Scholar and enrolled in the School of Philosophy and Political Economics at Oxford. He was one of the few members of the Communist Party at Oxford and was active in spreading propaganda in support of Indian independence. In July 1935 Stephensen published The Foundations of Culture in Australia: An Essay Towards National Self-Respect. It is a vigorous call for an Australian national culture which has remained influential among literary circles although seldom acknowledged as such. As the culture of every nation is an intellectual and emotional expression of the genius loci, our Australian culture will diverge from the purely local color of the British Islands, to the precise extent that our environment differs from that of Britain. A hemisphere separates us from “home.” We are Antipodeans; a gum tree is not a branch of an oak; our Australia culture will evolve distinctively.
. . . what is a national culture? Is it not the expression, in thought form, of art-form, of the Spirit of a Race and of a Place? It is culture that provides “permanence” for a nation while all else moves on. Culture transcends “modernism” and the ephemeral nature of politics, society and economics. Race and Place are the two permanent elements in a culture, and Place, I think, is even more important than Race in giving that culture its direction. When races migrate, taking their culture with them, to a new Place, the culture becomes modified. It is the spirit of a Place that ultimately gives any human culture its distinctiveness. It is literature, according to Stephensen, that gives the greatest sense of Place and Race and Permanence to a nation and which indeed creates the nation. Robert Burns is an example of the way Scotland as an “idea” is expressed. With England, Chaucer, Shakespeare, Dickens . . . more so than the politicians, merchants and soldiers. The “idea” of the French nation has been likewise expressed through Montaigne, Rabelais, Voltaire, Victor Hugo, Balzac . . . and Germany lives in Goethe, Heine, Kant, Hegel, and Richard Wagner. Russia has its Dostoevsky, Tolstoy, Chekov, Maxim Gorky; Scandinavia, Ibsen and Knut Hamsun . . .
Landscape painting in Australia, however, was never based on a journalistic element. Landscape painters had to examine Australia carefully, expressing “the Spirit of the Place,” the strange contours of the land, the solitude and the light quality of the atmosphere that symbolize most purely what is Australian. Australian painters were also dependent upon a national audience and market, not a world market where art is prostituted for money. The painting is individual while the book is mass produced. Although art can be internationally appreciated it is “nationally created,” “formed locally no matter how it might travel.” Regardless of how travel and communication break down barriers, local cultures remain. A creative thinker contributes to the culture of his own people first and then to the culture of the world. But a writer or an artist needs the stimulus of his own people. Stephensen attacks those academics who sought to demean Australia as a nation and as a culture by forever subordinating Australia to Britain and the British Empire. He acknowledges that it is the English culture from which Australian culture will proceed, but it was the plant that would grow, rather than the English fertilizer that would now be of concern. Culture is the essence of nationality, the nation, an extension of the individuals that comprise it, “generation after generation.” Nationality gives the individual a sense of pride and meaning. Stephensen draws on a Spenglerian cyclic analysis of history in stating that nations and empires eventually undergo decline over the course of centuries. He foretells Britain’s decline during the twentieth century. In 1935 a wealthy businessmen, W. J. Miles, whose wartime activities included opposition to conscription and advocating the concept of “Australia First,” contacted Stephensen after reading Foundations. Together they launched a magazine, the Publicist. The paper lasted until 1942. It was described as “the paper loyal to Australia First.” Miles was in editorial control. His views were overtly pro-Axis. German, Italian, and Japanese propaganda material was sold at the Publicist offices. A free hand for Japan in China was supported, at a time when the Left was calling for a boycott of Japan. Stephensen viewed Japan as “the only country in the world completely free of international Jew Finance.” Stephensen believed that there would be a world war involving Australia within a few years (1937). He saw no advantage to Australia in sending her men to spill their blood in Europe. Many Australians remembered the huge losses suffered during World War I caused partly by the unrealistic orders of British commanders. A man of harsh vitality, a born leader, a man of action, no what sicklied o’er with the pale cast of thought. Fanatics are needed, crude harsh men, not sweetened and decorous men, to arouse us from the lethargy of decadence, softness and lies which threatens death to white Australia. From 1936 the Publicist started putting forth ideas for an Australia First party. In 1938 readers’ groups suggested a twelve point program as a basis for discussion. The principal group was the Yabber Club in Sydney. In the September issue of the paper Stephensen stated that he had campaigned for peace with Germany since any war Australia fought should be for Australian rather than Jewish interests. The Publicist was now subjected to wartime censorship and paper restrictions. While the pro-Germany sentiments had to be toned down during 1940, the Publicist maintained its friendly attitude towards Japan. Once Australia was engaged in the war with Japan, the paper opposed any defeatist tendencies but continued to advocate home defense rather than sending Australian troops far afield, and the right to negotiate independently and sue for a separate peace. Stephensen formed the Australia First Movement in September 1941. A major element in the formation of the movement was the Sydney Women’s Guild of Empire, formerly antagonistic towards the Publicist due to the issue of loyalty to Britain. The mainstay of the Guild was Adele Pankhurst Walsh of the British suffragette family. On migrating to Australia she had married the militant Seamen’s Union organizer Tom Walsh in 1917. Both became founder members of the Australian Communist Party. Tom lectured to the near-fascist “New Guard” and was outspokenly pro-Japanese. Half the audience was antagonistic, and Stephensen in particular was met with opposition. He was hit over the head with a water carafe, knocked to the floor, and kicked by a group. The police were slow to respond. However, once order was established, Stephensen continued with the meeting despite his beating and continuing interjections. Stephensen addressed the meeting for around 80 minutes. He demanded that American troops in Australia be subject to Australian command and stated that they should be there to protect Australia not to further other American objectives. On orders from the Attorney General Dr. Evatt, Australia First was prevented from holding further public meetings by the police. Stephensen posited his 50-point manifesto for an Australia First Party to be founded after the war. In the May 1, 1940 issue of the Publicist these brief points were greatly expanded upon. On August 1, 1941 under the heading “Towards a New Order” it was stated that these were principles, not planks, for a democratic parliamentary party. “Our self-imposed task was to throw a stone into the stagnant pond of Australian political complacency” Stephensen writes in the preamble. The fourth point calls for “nationalism, against internationalism.” Nations are natural political units defined by racial and political factors. Point 6 favors “national socialism, against international communism.” However, Stephensen repudiates any monopoly of the term National Socialism by Germany. “We support all NATIONAL forms of socialism, as against the international version of socialism favored by Marxism.” In those sectors of the economy where private interests would become a power over the nation, the State would be required to intervene. Further points call for frankness and honesty in diplomacy, with a “live and let live” attitude minus the moralizing towards others that leads to war. The emphasis on defense was to be to protect Australia rather than serve other interests overseas. An attitude of friendliness was to be fostered towards nations bordering the Pacific Ocean, which could only be achieved when Australia was not subordinate militarily and diplomatically to British or other interests. Stephensen considers a declining birth rate a symptom of decadence which would lead to the extinction of Australia, especially when there were suggestions to make up for the population shortfall through immigration. He called for a white Australia as a “biological aim” to create a permanent home for persons of “European racial derivation.” This would exclude “Semites” and other non-absorbable immigrants. However, Stephensen’s championship of “Aryanism” cannot be dismissed as simple racial supremacism. Stephensen was an avid supporter of Aborigine rights, serving as secretary of the Aborigines’ Citizenship Committee, which supported the Aborigines’ Progressive Association comprised of an Aborigine only membership. The Abo Call was a magazine that sold in the Publicist office alongside the Axis journals. Introducing women into the workplace and away from child bearing under the name of “feminism” is attacked further on in the manifesto as leading to the decline in the birth-rate as well as undermining the wage standard. Much of the rest of the manifesto is an attack the on democratic and parliamentary system. Interestingly, in this light, despite Stephensen’s aversion to British and other outside influence, he upheld monarchy rather than the idea of an elected head of state under a republic. Stephensen desires a government of statesmanship and with stated long term principles, as opposed to short term vote pandering by political parties which leads to compromise and demagoguery rather than recognizing the harsh polices required for survival. The organic social order had existed until the French and American Revolutions. Stephensen explains how these upheavals undermined the traditional social order with “democratic sectionalism,” and “an alleged equality inspired by the thoughts of J. J. Rousseau,” the Swiss rationalist philosopher. The result, under the facade of democracy and equality, has been not to empower “the people,” but to empower industrial and financial interests which are able to use democracy to undermine any authority and power. However, Corporatism enables the social organism to function as “an integral whole” subjecting sectional interests, whether class or party, to the interests of the community, like the cells of biological organism all function for the common good of the whole organism. While Stephensen believes this Corporatist or organic state is necessary to bring harmony between the social and economic classes, and expects both capital and labor to restrain their sectional demands for the benefit of the whole, his ideas on financial and economic policy do not seem to have been well-developed. Despite his opposition to “international Jew finance,” as he put it, and his recognition that the Axis countries had thrown off the power of the plutocrats, his statements of policy do not reflect a recognition that the Axis economies were based on State regulation of credit and currency creation and a system of trade based on barter. Instead Stephensen opts for more orthodox banking practices and condemns theories of credit expansion and specifically Social Credit, to which many like minded men of letters such as Ezra Pound and T. S. Eliot adhered to as a means of overthrowing the rule of money. He does, however, expect capitalists to invest their capital into productive enterprises rather than those of a speculative nature, once the State has ensured an economic climate generating reasonable returns for such investment. Stephensen, like other Rightist men of letters such as Ezra Pound, retained friendships with Jews as individuals, but expressed animosity towards a perceived Jewish political agenda and regarded Jews as an unassimilable minority. Stephensen presented his “Reasoned Case Against Semitism” in 1940 in The Australian Quarterly. He states that anti-Semitism arises as an anti-toxin to the toxin of an aggressive “pro-Semitism.” His concern with the Jewish question seems to have been particularly prompted by a suggestion that a territory in north-west Australia be set aside for Jewish refugees from Europe. Stephensen opposed any “cessation” of Australian land. Stephensen compares the manner by which a small number of Jews are able to wield immense influence through a superior close-knit communal organization to the manner by which communist cells were able to insinuate themselves into institutions and get their measures adopted by an unsuspecting and largely lethargic majority. The “too-zealous propagandists of the Jewish Cause” in Australia had done the Jews a disservice by drawing attention to the Jews as a distinct community, for Anti-Semitism is a reaction to aggressive Pro-Semitism and neither exists unless a nation is in a pathological state. It is of interest that the white Australia policy was not an imperial or capitalistic origin but was one of the primary aims of the Australian Labour Party, which met principal opposition from both the British Colonial Office and from Australian business interests which sought a pool of coolie labor. Should Jews forgo their Jewishness and fully integrate and intermarry there would be no Jewish problem. That they do not do so is their choice, and Stephensen is here convinced that they will never forsake their Jewishness, so the Jewish problem will remain. Here then we are faced with a defiance by Jews of the fundamental principle of Fused-European Homogeneity which it is the basic aim of Australian national policy to establish and maintain. They claim the right not only to settle here but to maintain themselves in perpetuity, as a self-segregated minority, of different and distinct racial stock from the rest of the Australian community. It is, as he points out, a matter of perspective. As a non-Jew in any conflict of interest between Jew and Gentile he would instinctively side with his own. Stephensen’s loyalty was to Australia, and a large migration of Jewish refugees from Europe would undermine the Australia which he wished to see developing as a nation, culture, and people on its own account. Such sentiments were regarded as treasonous by the authorities whose Government had tied Australia to British imperial and American interests. Additionally, several individuals and groups had gained the attention of the military intelligence as possible collaborators in the event of a Japanese invasion. Some of these had had some contact with Stephensen’s Australia First Movement. “Enemy aliens,” including those who were anti-Fascist, were being interned. Sixteen supporters of the movement, including Stephensen, were detained under Regulation 26 at Liverpool internment camp in March 1942. Police occupied the Publicist office. The poet and author Ian Mudie, an executive member of the movement, although questioned, was not interned, although he was to comment that he must be either as “guilty” or “innocent” as those who were. Transferred to Loveday, then to Tatura camps, Stephensen spent three-and-a-half years interned. After the war several ex-internees continued to campaign for exoneration and two issued a reprint of the 1942 issues of the Publicist to provide a “durable historical record” that would show their loyalty and patriotism. The poet and author Ian Mudie had been keen to see Australia First revived. However, Stephensen was optimistic regarding the development of Australia’s national consciousness, and believed the aims of the movement were being realized. The imperial connection was dissipating and there was a growing interest in Australian culture. 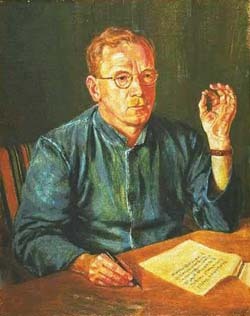 For the first decade after the war Stephensen was mainly involved in assisting Australian writers, principally Frank Clune. By 1959 Stephensen had sufficiently re-established his literary reputation to be asked to undertake a Commonwealth Literary Fund lecture tour of South Australia with his old friend Ian Mudie. The lectures were published as Nationalism in Australian Literature. Other such lectures followed in Queensland in 1961. His continuing theme of an Australian national culture by this time was meeting with wider support. Stephensen’s literary output continued at an impressive rate, and included The Viking of Van Diemen’s Land, The Cape Horn Breed, Sail Ho! Commodore, Sydney Sails, The Pirates of the Big Cyprus, and Sydney Harbour, published posthumously in 1966. In 1960 he was appointed managing director of the editorial department of a major publishing firm. Stephensen collapsed and died on May 28, 1965 after giving a lively address on Lawrence’s Lady Chatterley’s Lover. He never moderated his beliefs. Chapter 10 of K. R. Bolton, Thinkers of the Right: Challenging Materialism (Luton, England: Luton Publications, 2003).